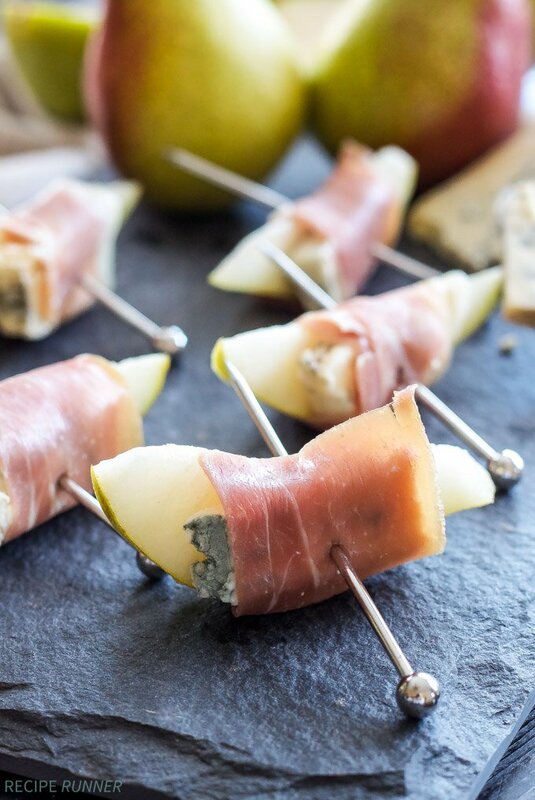 Three ingredients are all you need to make these tasty, two bite, Prosciutto Wrapped Pears with Blue Cheese. This easy to make appetizer is sweet, salty, tangy and hard to stop after eating just one! 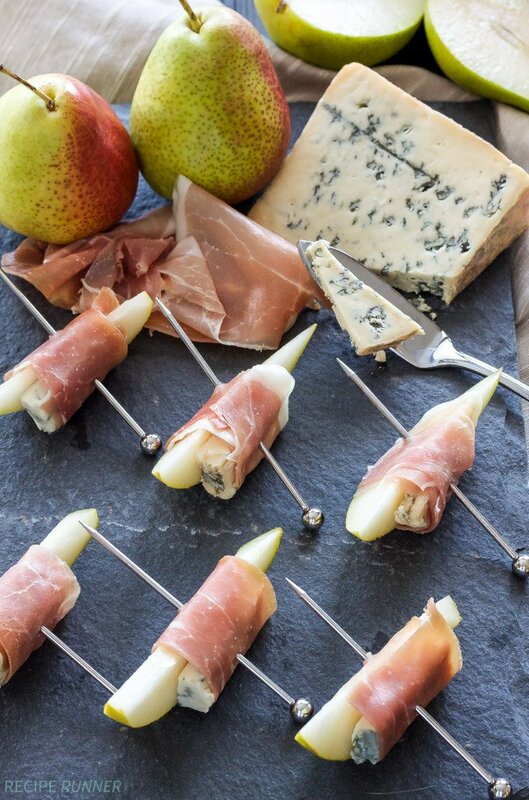 I’m all about easy appetizers and these Prosciutto Wrapped Pears with Blue Cheese are pretty darn easy to make. If you can slice a pear and blue cheese, stick those slices together, then wrap them in a piece of prosciutto, then you can make this appetizer! Do you have big plans for New Year’s Eve? My husband and I used to go out or have parties and really celebrate ringing in the new year, however the last few years we’ve been staying home. I know it’s pretty lame, but for one it’s a miracle if I can even stay awake until midnight and not to mention the end of December isn’t exactly warm here in Colorado and the thought of standing outside freezing my buns off isn’t appealing. You know what is appealing? Staying at home making awesome appetizers and mini desserts and doing it all in my comfy pajamas with the fireplace going! Yep, that’s what we’ve been doing the last few years and it’s looking like we’ll be doing it again this year. 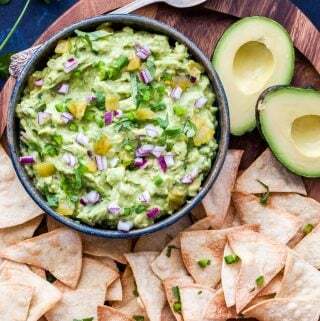 We usually make at least three appetizers along with two or three mini desserts, because both my husband and I share a love of sweets, it’s nice it worked out that way. 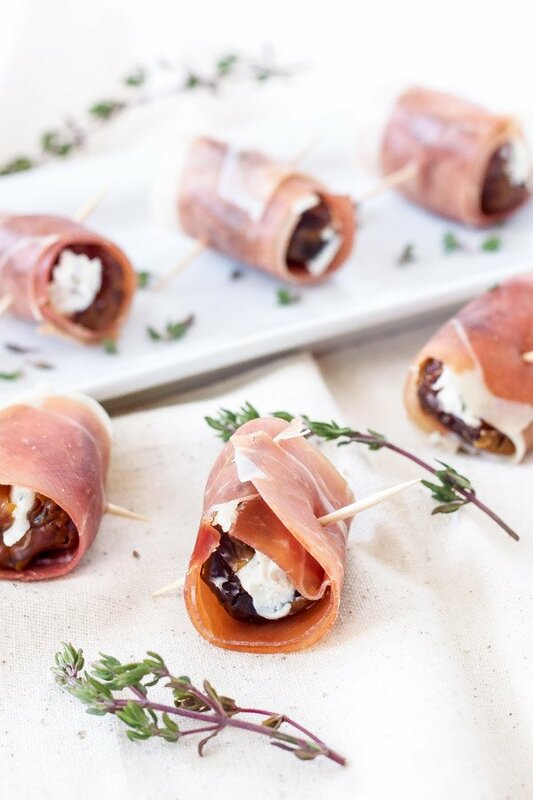 This year one appetizer that will be on the menu are these Prosciutto Wrapped Pears with Blue Cheese. You’ve probably noticed I have several recipes on the blog that involve wrapping something in prosciutto and that’s because I absolutely love it. I love the saltiness of the cured meat and how thin and delicate it is, perfect for wrapping around things! 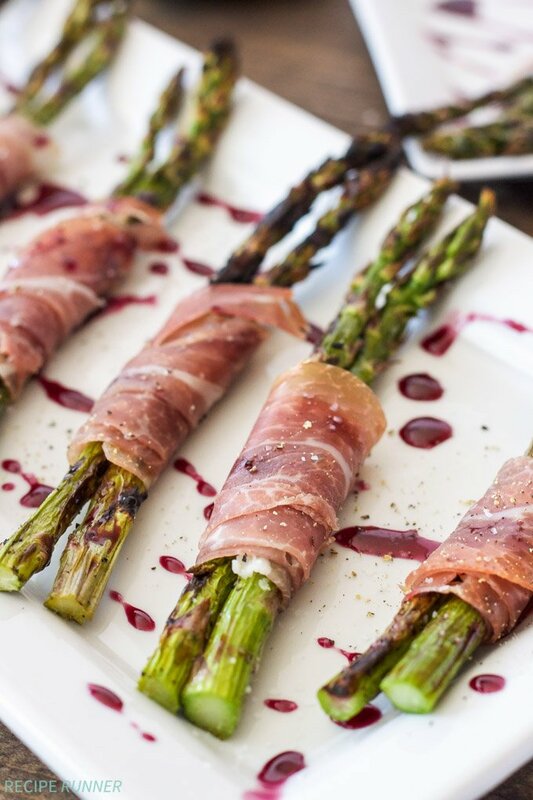 Prosciutto is particularly delicious when you wrap it around something sweet. Dates have always been my go to, but this time I thought a sweet juicy pear would be fun to try. Where there are pears there must also be blue cheese so of course I had to stick a slice in this two bite appetizer. 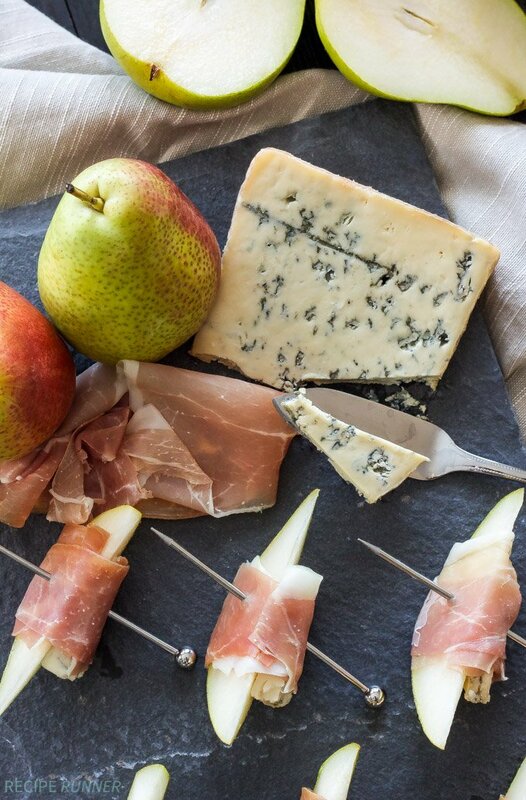 The combination of the pears, blue cheese and prosciutto is a flavor explosion for your tastebuds and I guarantee you won’t be able to just eat one. If easy to make, effortless appetizers are what you crave then you are sure to love making and eating these! Cut the slices of prosciutto in half lengthwise. 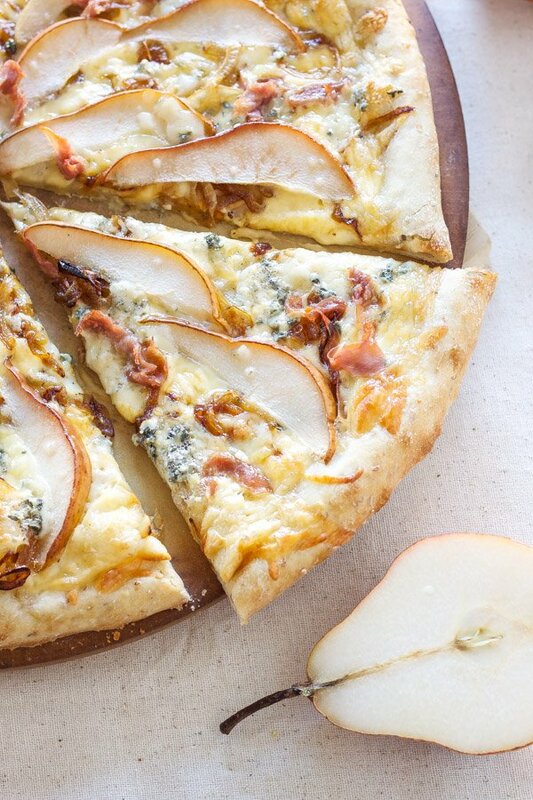 Place a piece of the blue cheese against the flat sliced side of the pear. 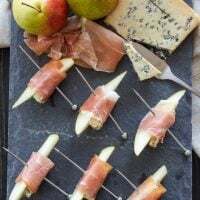 Wrap one of the strips of prosciutto around the pear and blue cheese and place a toothpick or appetizer skewer through the center of it. If you don't plan to serve immediately, rub the pears with a little bit of fresh lemon juice to prevent them from turning brown. 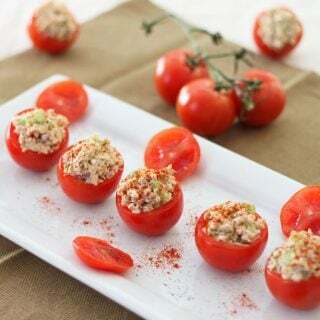 This appetizer is best eaten the day it is made. yum! I just so happen to have a really nice wedge of bleu cheese right now too! I'll have to do these for New Year's Eve! How convenient! I hope you like them! prosciutto + cheese + fruit definitely equals a winning recipe! Yes it does David! Thank you! 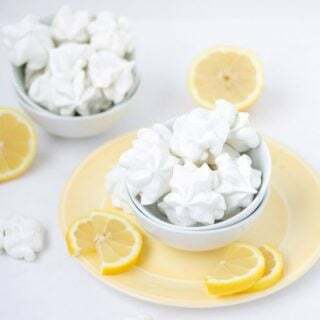 Simple flavors are often the best--this is sweet and salty perfection! I absolutely agree! Thanks Kristen! I love how simple and elegant these are. What a great flavor combination! Now I've had bacon and apples and cheddar but this is far far better Danae! 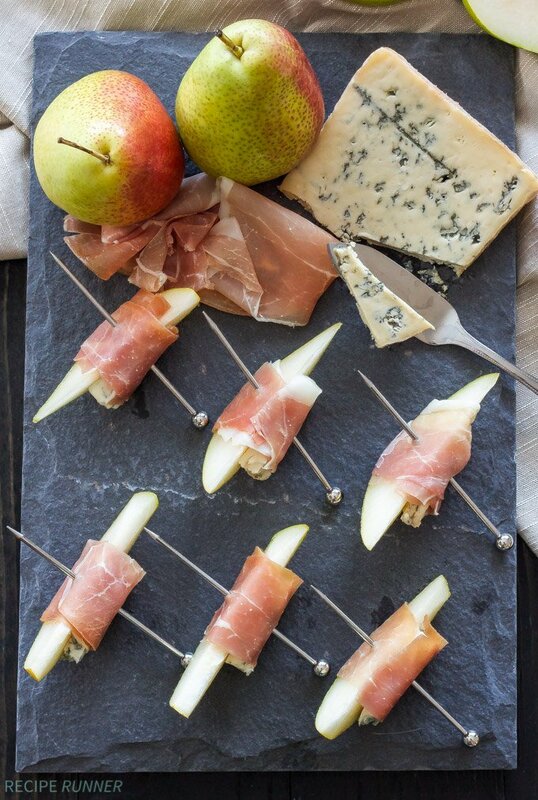 Love love love the combo of milder prosciutto with pears and blue cheese! This looks delicious. I know this is an older post but do you think this would be good with Apples? And if so what kind?!? Hi Nichole, I think apples would be a great substitute for pears. If I was making it I would probably go with a nice crisp, sweet apple such as a HoneyCrisp, Pacific Rose or Fuji. A drizzle of honey to finish it off would be great. Enjoy! Took these to a party last weekend. I had some fig jam on hand and tucked a dollop of that between the blue cheese and the pear. I doubled the recipe and they were GONE in 20 minutes. Delicious. Genius combination. Glad they were a hit Jill and I love your addition of the fig jam, I'm trying that!